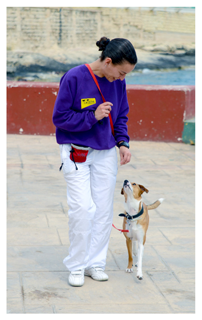 In the beginning of (dog training) time there was a strongly held belief that behaviour should be modified or ‘trained’ using positive and negative techniques i.e. reward and punishment. Fido got something nice (a reward) for good behaviour and something nasty (a punishment through a check with a chain, scruffing, shouted at or even something worse) for bad behaviour. Revolution arrived in the form of reinforcement training, rewarding good behaviour to encourage repeated behaviour without using punishment. The basis of kind, fair and effective training. 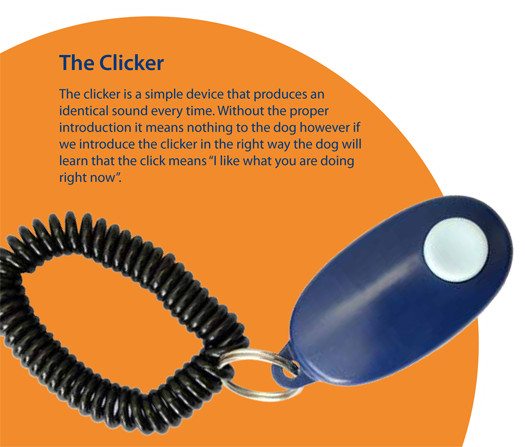 Now we have a new form of reinforcement training – Clicker Training. This is an outstanding method of training whereby Fido offers us multiple behaviours and we reinforce the behaviours we choose. Thus training the dog without force or punishment with a method that encourages Fido to learn quicker and be more willing. If I were to throw a 1€ coin on the floor near you, you would obviously bend over to pick it up. I will click as soon as you touch that 1€ coin. I repeat this say 20 times. 20€ richer you have learned that every time you heard the click you get a 1€ coin and as a result you are starting to really like that click sound! Now I’ll stop throwing coins at you and wait for you to try something else. If I want you to sit in your chair I would wait till you do that and click. Knowing this means you get a 1€ coin you come for your prize. Once again I wait for you to sit in your chair to click, you come for your 1€ and we keep doing this say another 20 times. With 40€ in your pocket you should know that sitting in your chair will likely get you more money. There can never be enough money, right? If I were to now say the word “bananas” as you sit and I click and I give you 1€ for another 20 times. What do you think the word “bananas” now means to you? If I were to replace you with a dog, give him little pieces of boiled chicken instead of money, and the word “sit “ instead of the word “bananas”, the dog will learn to sit when we say “sit”. The first thing to do is introduce the clicker to Fido. Firstly press the clicker once to test Fido’s sensitivity to the noise. Most dogs have no problem but for dogs with some hearing sensitivity you may have to initially muffle the clicker by using it in your pocket or inside a sock. Then throw a food treat on the ground, as soon as his tongue touches the food you click. Do this several times until Fido has learnt that clicks mean tasty food. Well done – you have already trained Fido something new! Remember to always give a treat after the click; the clicker should never be used alone. The one thing that most people ask is “Why bother with the clicker?” Doesn’t a ‘good boy’ or ‘girl’ at the right moment work just as well? The answer is NO, because Fido hears the words ‘good boy’ a lot during the course of the day. When he settles down, when he eats his dinner, when he goes to bed. These simple words are generally not special enough to be consistently used as a reward for desired behaviour. How many times have you said “good boy” only as a matter of duty and fail to place the appropriate positive feeling in to the words? The meaning of ‘good boy’ also varies with who says it while a click is always consistent. Using a food reward alone is very difficult as you would have to ensure that the food is delivered with absolute accuracy of timing. This is more difficult than you imagine. 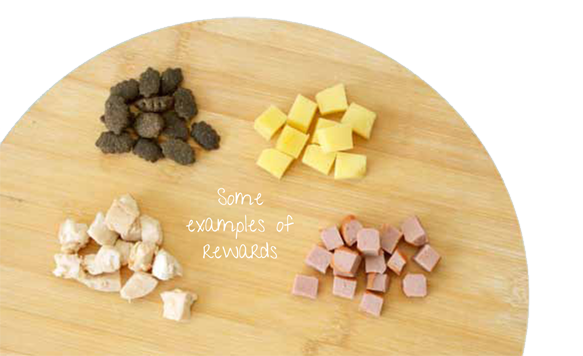 Rewards can have a different meaning for every dog. Most dogs will be happy to work for a small piece of tasty food like boiled chicken but some may prefer a cuddle or a toy. The reward needs to be something that your dog really likes. Do not deprive him completely of it during other times as this would produce frustration during training. Use Fido’s favourite food as a treat or his favourite toy as a training aid but do not do any training when he’s hungry or deprive him of other toys. The greater the winnings the more likely the dog is to repeat a behaviour. If you throw in a higher value treat or several treats for successful behaviours once in a while the dog will learn to do it more often hoping the next one hits the jackpot. But remember to only give a jackpot once in a while, not every time, otherwise these extra big rewards will stop being a special jackpot and start being seen as a normal size reward. Luring is the action of using food to lure a dog into a position or an action you are trying to teach them. 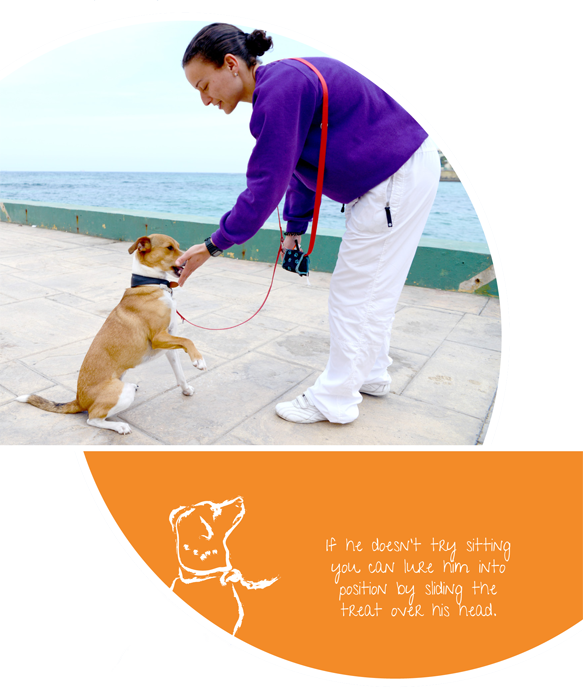 It is useful when a dog doesn’t naturally exhibit the behaviour in the initial stages of training. When can you start training your dog? Any dog can be trained at any age of his life but the earlier you start the better. Puppies and juveniles are geared to learn so they achieve the skills they will need later in life so they pick up things faster. Adults and old dogs will be slower because they’ve already done things differently for years and they are at a pint in their life when they should have learned everything they need to know. This only means it might take a bit longer but it is still possible to teach old dog new tricks. 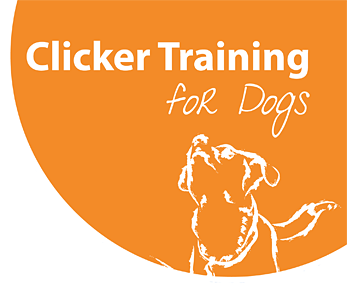 Clicker training should be fun for everyone involved, especially your dog. Find a nice quiet place that your dog knows well to start training a new command, so your dog is in the best possible frame of mind when you start. Keep the sessions short, just two minutes or less to begin with and then you can build up to a few minutes, but always limit the sessions to a maximum of 10 minutes. You may need to introduce the clicker at the start of every training session at first. If your dog starts to get confused you may have gone too fast or for too long, take a break and come back again later for a shorter session. Once your dog has learnt a new behaviour really well you can start training him in different locations, so he can learn that the same behaviour is expected of him whenever you ask for it – don’t be surprised if you have to take a few steps back when you start again somewhere new, he’ll soon catch-up. Show your dog you’ve got treats and sit straight and wait for the dog to start trying everything he’s ever done to coax you into giving him the treat. When he sits, you need to click as soon as his bum hits the floor and then reward. If he doesn’t try sitting you can lure him into position by sliding the treat over his head. He’ll have to sit to be able to look up. If you put it too high he’ll reach up for it and if you put it too low he’ll start walking backwards. When he finally gets it right give him a jackpot reward. Practice many times to get it just right. If you click and reward as soon as he sits he will reliably learn to sit when he wants a treat. Continue by doing the same action but without a treat in your hand. Click and reward for sitting. You can now give it a name. Say “Sit” just before he sits, click and reward when he does it. 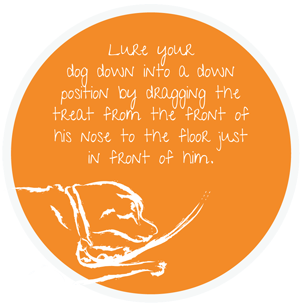 In the sit position, lure your dog down into a down position by dragging the treat from the front of his nose to the floor just in front of him. To follow the treat he will need to lie down. Click and reward as soon as he lies down. Repeat this a few times and then start luring him to the floor with the same hand but without holding a treat. Click and reward for lying down. Slowly increase the distance between the dog and the hand carrying out the action. Click and reward for lying down. Now you can give it a name. Say “Down” just before he lies down, click and reward when he does it. If you haven’t taught the dog his name yet, you’ll need to go back and do it. At random times while in the house call the dog’s name. When he looks, show him a treat but don’t throw it. Wait for him to come and get it. As soon as he gets off his bed, or turns to walk towards you, you need to click to let him know that is exactly when he got it right. Give a jackpot reward for this command every now and then if you really want a reliable recall. Repeat this several times a day for a few days and when the dog comes every time say “Come” just before he Comes, click and reward when he does it. This is a tricky one and you’ll need to work slower on this one than all the others. Say “Stay” and while the dog is still in the same spot give him a treat right away. 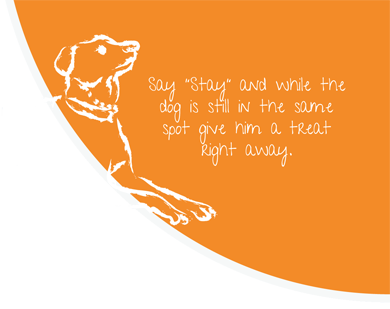 Repeat several times before starting to widen the gap between the word “Stay” and the reward. Slowly build up to your desired time. The greater the gap the more interesting your reward will need to be. When you’re happy with how long your dog stays in his original position, start building the distance. Do not show him you have treats, say “Stay”, take a step away and throw him a treat. Say stay take 2 steps away and go back to give him a treat. Take it literally step by step. If the dog gets up to follow you, go back to the distance he was last comfortable with and reinforce staying at that distance before further increasing the distance. “Heel” is a command used in dog training to signal to the dog that you want it to walk as close to you as possible. Show your dog you’ve got treats. Hold the treats in your left hand and start walking. 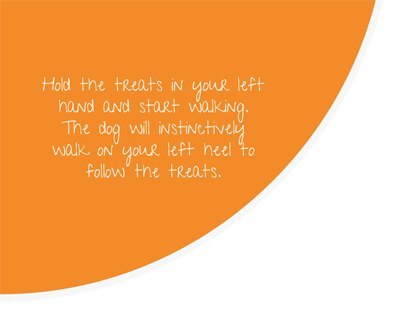 The dog will instinctively walk on your left heel to follow the treats. While he’s doing this, click and offer him a treat. You slowly want to start lifting your hand away from the dog, while he is still walking to your left heel, keep clicking and rewarding. Once the dog is doing this predictably when you walk with a treat in your hand, say “Heel” just before he does it, click and reward when he does it. Fetch is a great game for both owner and the dog. It provides excellent exercise and requires little movement from the owner and trained the right way is a great way to bond with your new puppy or even your older dog. Fetch is not just one behaviour; it is a succession of several tasks. The dog has to learn to chase the toy you throw, to pick it up, carry it to you, hand it over and let go. The dog may chase the toy when you throw it but most likely will run in your direction with it and either pass by you or turn away and run. This is their favourite game of “chase me!” Since giving it back is the most important thing for this game we use a process called ‘back chaining’. Quite simply this means that we train the tasks backwards, so we start with training the dog to let go of the toy in our hands and then we train the dog to pick it up from our feet to bring it to our hand and then we slowly increase the distance we throw it. It helps to use a toy that the dog is interested in already so much of the work is done. Hold the toy out in your hand and click as soon as the dog holds it. Do this several times so the dog learns the toy needs to be in his mouth and your hand at the same time to get a click and a reward. Knowing click means a treat is coming he will let it go to get his treat. He has now learned that the toy needs to be in your hand (and his mouth) to get a treat – this is the retrieve/fetch. If the dog decides to start pulling on the toy you may need to have a break and continue at a later time from the first step. Make sure the he doesn’t get bored with training, remember it should always feel like a game. Repeat this process at the start of the first few training sessions. Once the dog has learned that the toy in your hand and his mouth and letting go is what gets him rewarded, start throwing the toy at your feet at first and wait for the dog to pick it up and put it in your hands, click and reward. If the dog doesn’t pick it up and bring it to you than you have moved too fast and you’ll need to go back one or two steps. Always click and reward for a job completed. As the dog is practicing this, you may slowly increase the distance you throw the toy until you reach the maximum distance you can throw the toy. When you start practicing this outside you will need to start from scratch so the dog learns to generalize that this is what we do wherever we are. The dog has already practiced this at home so the learning will be much faster outdoors. Target training is an excellent exercise to do around the house to encourage your dog to think and therefore use some of that excess mental energy he would have otherwise invested in redecorating the house or pestering you while you try watching your favourite TV show. During target training we train the dog that he needs to touch a target with his nose to get a click and a reward. To teach them this we use a process called shaping. The dog doesn’t naturally know that touching an object gets him food so we click and reward the small behaviours that lead to it, such as, looking at the target, turning their head towards the target, taking a step towards the target and finally for touching it. We continue repeating this exercise so we reinforce touching the target. This alone has used up a lot of the dog’s metal energy. I can now use the target to move the dog from one place to another without ever needing to touch him. The Turn and The Weave. Next time we can use the target to train the dog to go to certain places or perform certain tasks by following the target. One example is teaching the dog to turn on himself to get a click and a reward. You’ll need to start with a few successful target touches and then a few successful follows so the dog understands that he needs to follow the target. Move the target around him slowly. Continue clicking and rewarding even the smallest attempts so the dog is reinforced to progress to the next step. Give a jackpot reward when the dog does a full turn. Introduce the command just before the turn, but only when the dog is turning every time and once the dog has practiced this and knows it well, slowly shorten the target stick and eventually just use your finger in a circular gesture. You can also train a dog to weave through your legs on command. Put the target between your legs and continue rewarding for the dog touching it and slowly move the target around your legs while the dog is still following it. If the dog gives up on following it you’ve either gone too fast or the dog is tired and needs a break. Continue during another training session and try going back a few steps. As the dog is successfully doing this, start introducing the command just before he does it. And slowly shorten the target stick until the command is enough to get the dog to weave through your legs. There are many more exercises that you can do with the target and, as you move the target around, you will continue to find new ones. Dogs have great fun with this exercise and it is amazing how many things your dog can learn when he is having fun. You do not want to be walking around with a clicker and treats everywhere forever, but don’t worry, you won’t have to. Once you’ve trained your dog to understand the above commands you can start phasing out the clicker and then the treats. Because we’ve already given meaning to the commands, we will phase the clicker out first as this was simply the tool we used to mark the correct behaviour. We continue rewarding for a while without using the clicker. If the dog becomes less reliable then we may need to go back and do more clicker work. If the dog is obeying commands reliably just for food then we can start phasing that out too. This is done by only rewarding a random number of successful outcomes. This will teach the dog that the next one might be the big one. That means that even without a reward he’ll be more likely to repeat the behaviour. Make sure to reward him once in a while or he may quickly learn that nothing gets him his desired treat and forget everything he’s learnt. After a while start hiding the treats in your pocket or a treat bag so the dog also learns to follow commands even if there isn’t any food.